World 1-1 is the first course of World 1 in Puzzle & Dragons: Super Mario Bros. Edition. 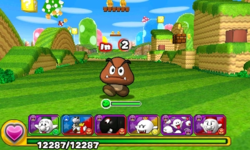 It is a basic, grassland level with enemies consisting of Goombas and Green Koopa Troopas. When the player enters this course for the first time, the game provides a tutorial of the battle mechanics. Clearing this course once unlocks Green Toad as a Helper. This level is straightforward, consisting of three battles with Goombas and Green Koopa Troopas, and a boss fight at the end with three Goombas. When playing this course for the first time, the Goomba at the center during the boss battle drops a Wood Block upon defeat. The player has only Fire, Water, Wood, and Heart Orbs on the Orb field. The boss battle of World 1-1. Goombas drop 1 Coin upon playing this course for the first time, and drop 0 for any subsequent visits. 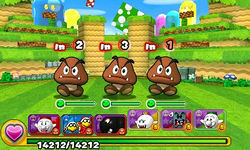 In the boss battle, each Goomba drops 6 Coins, but drop 1 Coin each after that. The boss battle Goombas deal more damage in any subsequent visits. ★World 1-1 is a difficult version of World 1-1 from ★World 1, with Light and Dark Orbs appearing on the Orb field and stronger versions of enemies. This page was last edited on August 12, 2017, at 17:04.